Hawaiʻi’s capitol – the “Square Building” on Beretania, although it’s actually 360-feet x 270-feet – is full of symbolism. The perimeter pool represents the ocean surrounding the islands; the 40-concrete columns are shaped like coconut trees; the conical House and Senate chambers infer the volcanic origins of the Islands; and the open, airy central ground floor suggests the Islands’ open society and acceptance of our natural and cultural environment. In 1959, an advisory committee was formed. They selected the Honolulu firm of Belt, Lemmon & Lo and the San Francisco firm of John Carl Warnecke & Associates to design the new state capitol. Their design was approved by the Legislature in 1961; construction commenced in November 1965. The building opened on March 16, 1969, replacing the former statehouse, ʻIolani Palace. Sato, the eldest of six children of Japanese immigrants who came to work on Maui’s pineapple plantations, was born (1923) and raised on Maui and attended King Kamehameha III School and graduated from Lahainaluna. He perfected his artistic skills over the next several decades, studying in Japan and New York and eventually became recognized as a member of the abstract expressionist movement and known for his abstract and semi-abstract paintings, mosaics and murals. Tadashi Sato was an artist of international stature whose work has hung in places such as New York’s Museum of Modern Art, the Guggenheim and Whitney, and the Willard Gallery. Aquarius is still arguably his most famous work of art. 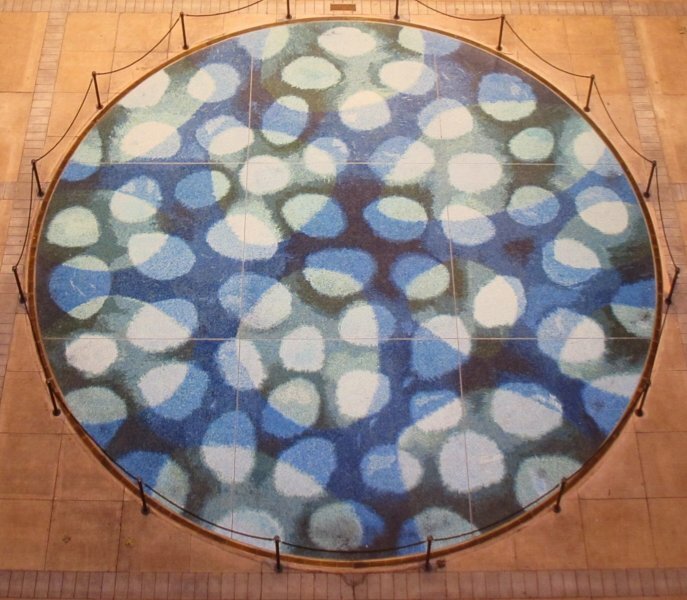 Standing on the upper floors of the capitol, looking down on the Aquarius mosaic, gives a view much like what Sato saw from the coastal cliffs of West Maui looking down on the shoreline and tidepools below. In 1965, Sato was honored by President Lyndon Johnson at the White House Festival of Arts, alongside Georgia O’Keeffe, Jackson Pollock and other American artists. In 1984, he was named a Living Treasure of Hawai’i by the Honpa Hongwanji Mission of Hawaiʻi. Exposure to the elements in the open air of the capitol took its toll on the mosaic. It has been replaced twice since its initial installation. Coincidental, but symbolic of the diversity of cultures in Hawaiʻi, in this most recent replacement/repair, a crew of six (Hawaiian, Filipino and Portuguese (from Hawaiʻi,) and German, Polish and Italian (from abroad)) set the new tiles in place. Fifty-seven different colors of various shades of blue, green and white tiles make up the Aquarius mosaic. However, it was at this time a new color was added; the Italian added a single red tile to the mosaic. Several sources incorrectly suggest the tile is representative of the artist’s signature. These folks also note you should search the mosaic for the single red tile. Today is ‘Adjournment Sine Die’ – the last day of this session of the legislature; tomorrow it is safe to go back to the capitol. The image shows “Aquarius” at Hawaiʻi’s Capitol.